The Attractional Megachurch BibleAuthorized Abridged Version 1.0By Elousia! The Official MetaNarrative for the Future Church! It is no longer necessary to consider the opinions of missiologists and linguists concerning the proper translation of certain biblical passages. The Attractional Megachurch Bible is the new approved version by popular consent. The AMB version contains stories only—stories that enhance one’s deeper understanding of God’s plan of redemption for Mother Earth. Be cool! Be hip! Avoid nasty doctrinal discussions that deteriorate into a debate. Escape the controversies about Bible versions, ancient manuscripts and texts – that’s the bad old story. The NEW STORY is the Bible in pictures and stories! Learn God’s deepest purpose and divine destiny for mankind! Experience ultimate fulfillment! Guaranteed to win friends and influence people! The Attractional Megachurch Bible is all about YOU! This positive and uplifting Bible promises eternal rewards right here and right now to all that seek an encounter with the Divine Self. Experience daily joy, peace, prosperity and positive affirmations. It isn’t how you live your life, it is how you dream God’s dream! All those who seek a higher spiritual path will be rewarded by this Bible’s simplicity and charm. Each passage of this happy Bible will walk you down sunlit paths into a mystical garden of sun-drenched colorful flowers and gurgling waterfalls. Experience the blissful euphoria of a pain-free, guilt-free, sin-free translation! Jesus promises a new life, the AMB version delivers! The Attractional Megachurch Bible, is a dynamic equivalent translation that tells stories through compelling narratives, fairy tales, poetry, mythology, self-help stories of victory, Internet legends, Facebook entries and fanciful folklore. The AMB version is fully downloadable for the joy of easy listening stories designed to amplify and accentuate your gifts! Jonah and the Whale—Join the Save the Whales eco-campaign! Jesus and Pilate—How to Seize the Kingdom NOW! Peter’s Vision—Join up with the Beyond Beef campaign! We Pressed the Delete Button! No more annoying passages! We expunged negative, troubling, accusatory, thought-provoking or guilt-producing passages. The Attractional Megachurch Bible is joyful, delightful, rosy, light and completely complimentary. Enhanced Passages Promise New Deliverance! The AMB comes in a convenient size! It fits in your cell phone case! 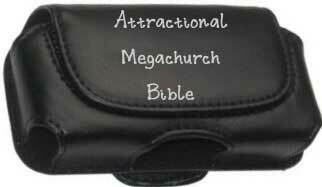 Now you can travel anywhere with your Attractional Megachurch Bible! The Attractional Megachurch Bible comes with state-of-the-art accessories that will help you to access the Mind of God. Our amazing new FIB App teaches you to construct new metaphors as you need them. Why should a Bible belong to the experts? Our patented IM-Oral Relativism feature provides a positive possibility platform for creating new textual solutions for every life situation encountered. Our special Yoda Yoga Instructional Guide teaches you to center, use the Force, visualize peace, drink kombucha and perfect your inner Self. Our unique cosmic Oracle-Portal Intuitive software enables you to uplink directly to the throne of God. No more need for prayers! Talk directly to the Source! Our portable SINSATE Adapter Mechanism connects you to a blissful encounter of pure passion, presence, and prosperity. Unlock your Divine Destiny with our patented Truth Transformer Module! Take the Assessment Tool Mind and Nebula Map (ATMAN) that will help you Mobilize your Mission Inner Self! Our Daniel Attractional Leadership Institute for Large Attractional Megachurch Attendance (DALI LAMA) offers classes in marketing, intestinal cleanses, vegan living, yoga, vibrational energies, sun worship, beer brewing, beach combing, loud music, paradigm shifting and quantum leaps. NEW! ATTRACTIONAL MEGACHURCH BIBLE now offers AMB DOCTRINAL WELLNESS SUPPLEMENTS! Dopamine-enhanced delivery system promises evangelical euphoria! Yes! While you are studying the AMB you can also earn points and get cash back! Jump start your health and wealth! Join with others on your road to cosmic wholeness and spiritual health. Sign up today to become a distributor in one of the fastest growing vitamin and supplement networks! Learn all about an AMB distributorship at healthydeceptions.com today! Network with the fastest growing dopamine receptors on the planet! Build your NETWORK, Build your MEGA-CHURCH! A dual-platform device that permits you to make money while you recruit new congregants! Order your AMB today at megattractional.com!